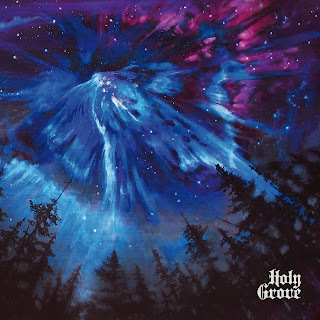 Coming from the fertile musical environment of Portland, Oregon, the four-piece of Holy Grove make their debut with this seven-track album, roaring into life with a blaze of strings and fuzz. With a heavy rock base tempered by traces of doom and desert rock, the band plays hard and puts all of its members to good use, spinning together sharp guitar solos, swampy bass, soaring vocals, and slamming drum-work for a first album that finds them already shifted into full gear, but ready to deploy some nitro for extra kick. Holy Grove show themselves to be just as adept at handling hard'n'heavy (as in the opening track, "Death of Magic", and the last one, "Safe Return") as they are with the more melodic ("Death of Magic"'s immediate follow-up, "Nix"), and they put in the care and effort to have all the different approaches flow just fine from one into another. Deftly handling their flare-ups into vibrant stomping ("Huntress", "Caravan"), the group shows a knack for keeping riff under-currents alive while diving headlong into break-downs and semi-improvisational-sounding bursts of thunderous, wild rocking. The one down-side I can pick out of the album is that the lyrics tend not to reach the same level of distinction as the rest of the music, though in fairness, they do match with the semi-mystical vibe that's brought to life. And considering that there's just that one point of roughness in the group's first album, that's pretty damn good. If you enjoy ambitious, sky-wide rocking with some magical trappings, be sure not to let this one slip past you.